UC Berkeley alum Anthony Ervin reacts after winning gold in the 50-meter freestyle, 16 years after he won gold in the same event. University of California athletes made a splash in the 2016 Summer Olympics, winning 31 medals — including 18 gold medals, more than all but four nations. Along with all that gold, UC-affiliated athletes brought home five silver medals and eight bronze medals from the Rio Olympics. UC Berkeley’s Dana Vollmer became the first American mom to win an Olympic gold in swimming. 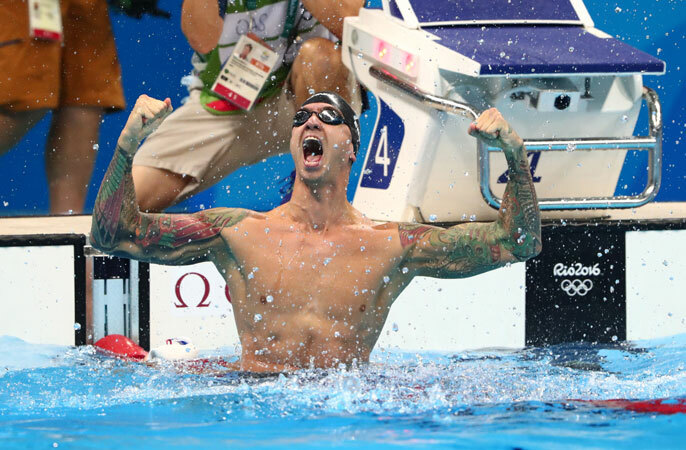 UC Berkeley’s Anthony Ervin became the oldest swimmer to win an individual Olympic gold. Madison Kocian, an incoming freshman at UCLA, dazzled as part of the gold medal-winning “Final Five” U.S. women’s gymnastics team. UCLA marathoner Meb Keflezighi, after a stumble near the finish, brought a roar from the crowd by doing a few pushups before crossing the finish line in style. U.S. women’s water polo head coach Adam Krikorian turned from tragedy to triumph within a month. When former UCLA water polo player and Sling Media co-founder Blake Krikorian, 48, unexpectedly died Aug. 3, the shock rippled all the way to Brazil, where his younger brother, Adam Krikorian, was preparing to lead the U.S. women’s water polo team in the Olympics. Adam, a former UCLA water polo player and coach, flew home to California to mourn with his family, returning to Rio in time for his team’s first match. Inspired by their head coach, the U.S. team — which featured five UCLA athletes (KK Clark, Rachel Fattal, Sami Hill, Courtney Mathewson and Maddie Musselman) — became the first women’s water polo team to win back-to-back Olympic gold medals. After receiving their medals, the women honored their coach in an emotional celebration: One by one, they put their medals around Adam Krikorian’s neck. The U.S. women's water polo team rejoices after an emotional win with Coach Krikorian. In all, UC Olympians won 25 medals in water sports, including 19 by UC Berkeley swimmers. UC Berkeley's Dana Vollmer (left) and Kathleen Baker (right) celebrating a gold medal in the 400-meter medley relay. Vollmer, the “Momma on a Mission” with her 17-month-old son, won gold in the 4x100-meter medley relay, silver in the 4x100-meter free relay and bronze in the 100-meter butterfly. Vollmer leaves Rio with a career total of seven Olympic medals, making her the second-most decorated women’s swimmer in Cal history, trailing only Natalie Coughlin, who has 12 medals. “This whole comeback has just been about family for me,” Vollmer said, according to TeamUSA.org. Ervin, 35, won the 50-meter freestyle, edging France’s Florent Manaudou by 0.01 of a second. Ervin, who previously won gold in that same event at the 2000 Summer Olympics, also won gold in the 4x100-meter freestyle relay in Rio. Fellow Cal alum and U.S. swimming team co-captain Nathan Adrian won two golds (4x100-meter freestyle relay and 4x100-meter medley relay) and two bronze medals (50-meter and 100-meter freestyle). He now has eight medals in his career, including five golds. UC Berkeley’s Ryan Murphy won three gold medals (100-meter backstroke, 200-meter backstroke and 4x100-meter medley relay), setting a world record for his backstroke leg in the medley relay, where teammate Michael Phelps won his record-setting 28th medal. UC Berkeley alum Tom Shields also picked up a gold medal for swimming in the prelims of the 4x100-meter medley relay while Josh Prenot won silver in the 200-meter breaststroke. UC Berkeley’s Missy Franklin won gold in 4x200 freestyle relay, while Kathleen Baker and Abbey Weitzeil joined Vollmer in winning gold in the 4x100 medley relay. Baker also won silver in the 100 backstroke and Weitzeil, an incoming freshman, won silver in the 4x100 freestyle relay. Ryan Murphy after winning the gold medal in the 200-meter backstroke. In track and field, UC athletes didn’t medal, but they still made their mark. UCLA’s Keflezighi, who won silver at the 2004 Olympics, completed his Rio marathon in style. Battling the elements and a stomach ailment, the 41-year-old slipped just steps away from the finish line. Keflezighi shook it off, did some pushups and returned to his feet to finish the race in 33rd place. UCLA alum Keflezighi's gutsy finish in Rio. UC Davis alum Kim Conley participated in her second Olympics, finishing 23rd in the first round of the 5,000-meters. Conley qualified for the 5K after she got stepped on and lost her shoe during qualifying in her primary event, the 10K, at the U.S. Olympic Trials. First-time Olympians included UC Berkeley’s Jahvid Best, the first retired NFL player to compete in the Summer Games, who ran in the same 100-meter heat as Usain Bolt; UC Irvine’s Charles Jock in the 800 meters; UC Riverside’s Brenda Martinez in the 1,500 meters; and UC Santa Barbara’s Barbara Nwaba in the heptathlon. Martinez qualified for Rio by 0.03 seconds with a photo finish lunge, rebounding after a collision in the 800-meter U.S. qualifying final. In women’s gymnastics, UCLA’s Kocian won gold in the team competition for the United States and silver on the uneven bars. Kocian's silver medal-winning individual performance on the uneven bars. In women’s soccer, incoming UCLA freshman Jessie Fleming won a bronze medal as Canada defeated host nation Brazil, whose team included another Bruin, Aline Reis. The U.S. women’s soccer team, featuring UC Berkeley alum Alex Morgan and incoming UCLA freshman Mallory Pugh, lost in the quarterfinals to Sweden. While Carli Lloyd the U.S. women’s soccer player didn’t win a medal, Carli Lloyd the UC Berkeley alum did win a bronze with the U.S. women’s volleyball team, as did UCLA alum Karsta Lowe. The team was coached by UCLA’s Karch Kiraly, along with assistant Tom Black, a UC San Diego alum and former Triton coach. David Smith holds up his bronze medal. UC Irvine alum David Smith and the U.S. men’s volleyball team, coached by UCLA’s John Speraw with staff including Bruins Andrea Becker and Erik Sullivan, also won bronze in a five-set thriller against Russia. Former Cal rower Olivier Siegelaar won bronze for Netherlands in the men’s eight competition. Coaches and staff members are not awarded medals at the Olympics, but also give an assist to UCSF Dr. Christina Allen. The U.S. taekwondo team physician helped Jackie Galloway overcome a sprained ankle in a semifinal loss. Galloway bounced back to win a bronze medal. Meanwhile, UC Davis alum Afsoon Johnston was a women’s freestyle coach for the U.S. wrestling team, which won its first Olympic gold medal in women’s wrestling, as Helen Maroulis upset three-time defending Olympic champion Saori Yoshida of Japan for the 53-kilogram freestyle title. In all, 102 athletes, coaches and staff with ties to eight UC campuses participated in the Rio Olympics, representing 18 sports and 27 countries. Among U.S. universities, athletes with Stanford ties won the most medals in Rio with 27, followed by UC Berkeley (21) and USC (21), Florida (13), Texas (13), Georgia (10), Michigan (10) and UCLA (9).